Dealing with the process of applying for and receiving disability benefits, whether it’s through the Social Security Administration (SSA), your employer, or a private insurer, can be a challenge, and many people are left with questions about what they can do to get the help they need. At the law offices of Loyd J. Bourgeois, we understand how hard it can be to get the answers you need. That’s why we’ve put together the following list of Frequently Asked Questions (FAQs) and answers dealing with personal injury, disability benefits, claims, and appeals and the related law in Louisiana. The following are some FAQs that I receive as a Louisiana attorney. They may answer some of the questions you have regarding your Social Security Disability appeal, your long-term disability insurance denial, or your personal injury claim. If you have a question that is not answered here, please call the legal team of Louisiana Disability Law, Loyd J Bourgeois at 985-240-9773. Loyd's Legal Insights: What is Conservative Care? I am St. Charles Parish injury attorney Loyd Bourgeois. I am here to help you get the answer to this question and more today on this installment of Loyd’s Legal Insights. Recently, I had the pleasure of sitting down with local chiropractor Dr. Mitchell Brien at his office on Highway 90 in Luling, Louisiana. We wanted to get some insight from his perspective on some of the frequently encountered issues he sees in his personal injury patients. I hope you will join us as we sit down with Dr. Mitchell Brien and learn more about the chiropractic process in personal injury claims. Conservative Care can have many different aspects. Basically, conservative care is a nonsurgical form of treatment. It can range from chiropractic care to physical therapy to medical treatment where the medical doctor prescribes medications. You get out of that conservative care when you get to a surgical intervention. That's what we're trying to prevent - a surgical intervention. Give me a call at 985-240-9773. Injury consultations are free. And, we will take care of you from our Luling office – right here on the River Road. Do I Have to Submit an Administrative Appeal of My LTD Denial? Can I just sue now? Our office received a call recently from Janice – a very nice, 56-year-old accountant who was dealing with coronary artery disease (CAD), diabetes, and chronic degenerative disc disease. Janice worked as an accountant at a large, chemical manufacturing facility for almost 25 years. She had to stop working due to her medical conditions and filed a claim for long-term disability benefits through her employer’s benefit plan. Unfortunately, she was denied because the insurer claimed she could continue doing her sedentary occupation. She was really angry and did not want to deal with the insurance company any longer because she knew she would not get a fair shake. Janice just wanted to sue them. After a few minutes, Janice asked – Do I Have to Submit an Administrative Appeal of My LTD Denial? The answer is yes if you received your LTD plan through a private sector employer. LTD coverage provided this way likely falls under ERISA and according to ERISA, you must “exhaust” your administrative remedies before you can file a lawsuit. This means you must follow the terms of the insurance policy and go through each step of the appeals process directly with the insurance company. If the insurance policy states that you must file one appeal, then you may only need to file one mandatory appeal. If the insurance policy requires you to file two appeals, then you must go through two appeals before filing a lawsuit. Other insurance policies have one mandatory appeal and one “optional” appeal. The key is that you must review your policy to see what it requires. In other situations, you may not have to file an appeal at all before filing a lawsuit. This may be the case if you have an individual policy purchased directly from an insurance agent or broker, or if your policy is sponsored by a government or church employer directly. Again, you should read your policy. Loyd's Legal Insights: What is Chiropractic Care? I am St. Charles Parish injury attorney Loyd Bourgeois. I am here to help you get the answer to this question and more today on our first installment of Loyd’s Legal Insights. Recently, I had the pleasure of sitting down with local chiropractor Dr. Mitchell Brien at his office on Highway 90 in Luling, Louisiana. We wanted to get some insight from his perspective on some of the frequently encountered issues he sees in his personal injury patients. I hope you will join us as we sit down with Dr. Mitchell Brien and learn more about the chiropractic process in personal injury claims. We work closely with the joints, mainly neck and back, but also shoulder, hips, and knees and every other joint in the body to try and restore proper biomechanics to the body. After these injuries, a lot of the mechanics are disrupted, and we want to make sure that those mechanics are reestablished into the body. After a car accident type injury, the muscles will a lot of times tighten. We want to make sure that we relax those tightened muscles. When muscles tighten, it has a domino effect, so the joint gets involved and it gets restricted. So we want to increase that range of motion back to that joint. And that's the focus of those types of treatments is to restore that mobility back to the body that is taken away due to those types of injuries. What is a Long-Term Disability Buyout? Should I Accept A Disability Lump Sum Payment? A long-term disability insurance buyout is when the insurance company offers you a lump sum of money now in exchange for never having to pay you again on the policy. Hank is a 45-year-old surgeon who developed cancer and as a result of his treatment is left with hand tremors and other neuropsychological symptoms. Hank purchased a long-term disability policy that paid him $20,000 per month (or $240,000 per year) until age 70 provided he remained disabled under the terms of the policy. Since Hank is 45, the policy can remain in effect for 25 more years with a lifetime payout of $6,000,000. Hank’s long-term disability insurance company has offered him a buyout. What should he consider when deciding whether to accept or reject the settlement offer? Obviously, each situation is different and you should seek out the information necessary to help you make the best decision in your specific circumstances. Our team at Louisiana Disability Law is skilled at guiding hard-working, disabled people like you through the long-term disability process. We can help you effectively evaluate any long-term disability buyout offer and negotiate on your behalf. Give us a call today at 985-240-9773 if you received a buyout offer and don’t know where to begin! 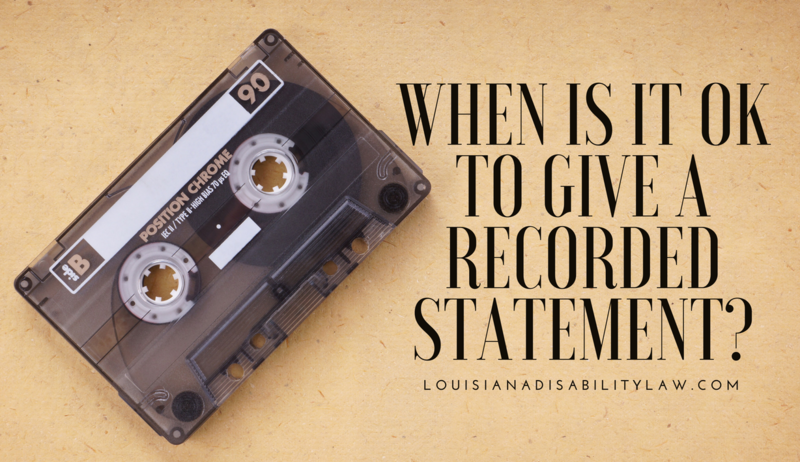 I am St. Charles Parish injury attorney Loyd Bourgeois and today we are going to talk about recorded statements. You have been in an accident, chances are you already got a call from an adjuster asking you to give them a recorded statement. We often get calls from clients and potential clients asking us whether or not they should give a recorded statement to the insurance company. Our opinion is - your focus should be on returning to your pre-injury condition! Focus on your health. Focus on your medical care and your medical treatment. If you are under any kind of narcotic pain medication we advise you to NEVER give a recorded statement to anyone. Beyond that, if it is your insurance company asking you for a statement it's okay to talk to them to them. They are there to help you resolve this claim. Chances are most claims can be resolved without a lawyer’s assistance especially those just involving property damage. So it is going to be okay to talk to your insurance adjuster about what happened, the extent of your vehicle’s damages, and those things. A quick, simple friendly interaction like: "How was your weekend, do anything fun?" "Pretty good, my daughter had a soccer tournament and then we went to a birthday party." could be used against you by the insurance company saying that you're well enough for a full day of activities. We do not advise that you speak to the other insurance company at least initially. You want to figure out exactly what's going on with your vehicle and figure out what exactly is going on with your medical care. And, you will probably want to do some research as well. Perhaps you should get a copy of the police report. Find out what are they going be looking for in your recorded statement. What are some tricks that the other insurance company may use when I give a recorded statement to the other insurance company? What are the questions that I should be asking the insurance adjuster? We advise you to seek legal assistance before you give them any recorded statement. The legal advice may simply be - look you don't really have any damages to your body or you're not hurt, and it's really just about your car so if they're willing to accept liability it's okay to talk to them to get it resolved. If you are hurt in any way, then it's probably a good idea to speak to an injury attorney before you even think about talking to the other insurance company because the advice will likely change specific to your case. I've written a book Quick Guide to Louisiana Accident and Injury Claims. This is a helpful and informative guide that will lead you through some of the common mistakes that can wreck your personal injury claim. Discover why you may not even need an attorney! Get answers to your questions about recorded statements, paying medical bills, getting your vehicle repaired, negotiating a settlement, and much more! Don't make a costly mistake that could cause you to accept a settlement that is too small to cover your medical bills and lost wages! You need to read this before you talk to an attorney or insurance adjuster. I'd love to send you a copy. Just click here to receive your free copy of my book Quick Guide to Louisiana Accident and Injury Claims. Again, I am St. Charles Parish injury attorney Loyd Bourgeois and our team here is always glad to answer your questions. Our injury consultations are free and we take care of you right from our Luling office. Just call us at 985-240-9773 or use our contact form. We look forward to hearing from you. Will the Long-Term Disability Insurance Company Spy on Me? More often than not, unfortunately, the answer is YES! I have piles of videos right here in my office of hard-working claimants who are fighting for disability who have been spied on by the long-term disability insurance carrier. If they send you a form asking about your activities. The carrier may call it an activity log. The carrier wants you to take them through your day. What do you do each day? What time do you do your activities? Another question the carrier may ask you is “when is your next doctor’s appointment?” What they are looking for is information to know when you're going to be out of the house and about because people often do multiple things at one time. For example, you may go to the grocery store, then go to the doctor’s office, and then go meet a friend – while you are out. They are looking to get you at that point in time. If your claim is at the any occupation stage. The carrier may get up to get a private investigator to follow you around to establish that you can do certain activities. My advice to you is pretty simple - be brutally honest with them telling them everything that you do even the minute details. Do not over exaggerate! For example, you don't want to say "I cannot drive" because if they find you driving they can say “oh this person is not credible.” You don’t want to say "I do not go out of the house," because if they find you just walking to your mailbox to check your mail they prove you a liar. It is OK to do these things. You do not have to prove under your disability insurance policy that you are completely inactive but if you tell the insurance company those things, it makes you out to be a liar when you are doing activities contradictory to what you told them on the activity log. As long as you are brutally honest with the long-term disability insurance company, you won’t give them any ammunition to deny your claim based on your credibility. That is one small victory that you need to take advantage of! I am long-term disability lawyer Loyd Bourgeois. I want to help you fight the long-term disability insurance company who wants to take your premium but does not want to pay your claim. Give us a call at 985-240-9773 so we can help you fight for the benefits you paid for, earned, and deserve! Should I meet the at-fault person’s insurance adjuster when they examine my car for property damage? No. Under no circumstances should you be with the property damage adjuster when they take pictures of your vehicle. It is important to remember that these insurance adjusters work for the other side. They are not there to help you. They are trying to pay as little as possible for both property damage and bodily injury. It is not uncommon for them to play tricks, such as asking you to retrieve information from your car’s glove compartment in order to photograph you bending over into the car. This can be used later against you during the injury case. We strongly advise that you have a family friend or other relative there when the adjuster examines the vehicle. It is also important that no one talk to the adjuster or reveal details about the accident or injuries sustained. Look over our personal injury FAQs for answers to questions like "Should I Give The Insurance Company A Recorded Statement?" and "How Much Is My Personal Injury Case Worth?" Have a question that you don't see listed? Or do you have a specific question about your unique case? Our team here is always glad to answer your questions. Our injury consultations are free, and we take care of you right from our Luling office. What should I do immediately after a car wreck? Believe it or not, I sometimes get phone calls from clients at the scene of their car accident wondering what they should do. Should you find yourself in a car accident, here is a list of the 9 things you should do immediately after the accident. Immediately after your car accident, the most important thing you can do is to make sure you, and anyone in the car with you, are safe. Of course, if anyone is seriously injured, that takes top priority. Call the police. Louisiana law prohibits people from leaving the scene of an accident until a full report has been made to the police. Exchange information with the other driver or drivers – usually the police officer will obtain and provide this information but you must be sure that you have it. Write down the name, address, phone number, driver’s license number, vehicle make, model and color, as well as the insurance information of the other driver or drivers involved. Get contact information from any witnesses. Do not make statements to the other driver or anyone else about the cause of the accident, but do tell the police. If you are hurt, wait for the paramedics to examine you. If they advise you to go to the hospital, follow their advice. Take pictures of all damages to your car and any others BEFORE moving the cars to the side of the road. Ideally, you should document the accident where it happened. If you are injured or feeling bad at all, go to the ER as soon as possible. This protects you, from a medical and legal perspective, and starts a document trail to prove you were injured. Follow up with your doctor as required. Do I Have To Submit The Worker’s Comp Report to SSA? We recently represented “Donald” who was injured on the job when attempting to lift a heavy object. Donald’s injury required surgery. Luckily for Donald, his injury was covered by worker’s compensation so it paid for the surgery. After Donald did not recover as expected, he filed for Social Security Disability. At some point during the process, however, Donald’s worker’s compensation insurer required he take a Functional Capacity Exam to determine whether or not he could return to his previous work. The FCE found that Donald was capable of working at the same physical level as before his injury. Clearly, this FCE did not support Donald’s claim for disability benefits – where we must prove that Donald’s limitations prevent him from performing any work. Simply put, this type of evidence hurts Donald’s claim. The question is this – Do we have to submit this unfavorable worker’s compensation report to SSA even though it does not help Donald’s claim? SSA has an “all evidence” policy that you and your representative must follow. This means that all evidence obtained in your case, even if it is unfavorable, must be submitted to SSA on your claim. If you have unfavorable evidence from a worker’s comp doctor or any other doctor, you should promptly advise your attorney so that an effective strategy can be developed to minimize the negative evidence. In some cases, one strategy we employ is to have your own doctor prepare a letter detailing why the negative evidence is wrong and/or problems with the methods, technique or conclusions of the negative evidence. Other strategies may be appropriate or required depending on your specific case. If you have a worker’s compensation claim or other negative evidence that you must submit to SSA, you should seek representation from a skilled and knowledgeable SSA attorney to help in your disability claim. Our team would love to help – give us a call or use our contact form. Can I negotiate my own personal injury claim? And if so, where do I start? Sure - you can negotiate your own personal injury claim. There is no law that says you have to hire a lawyer. But, just like you can change your brakes without being a mechanic or install a new roof on your house without being a roofer – some things are best left to the experts. And, unlike hiring a mechanic or a roofer, you don’t have to pay anything upfront to have a personal injury attorney start working on your case! Louisiana Personal Injury Lawyers are paid by receiving a portion of the money they are able to win for you. Additionally, most lawyers will front the costs of the case (like filing fees, expert costs, deposition costs, etc.) until the case is resolved. If you choose to pursue your own case, you will be responsible for all costs, which sometimes run into the thousands of dollars. Insurance companies are aware that individuals do not have the training or the legal skill necessary to file a lawsuit and try a case to a successful conclusion and as a result will offer a significantly lower amount of money to someone trying to negotiate their own claim. Without the legal skill and training, you may not accurately understand the value of your case or take into account all of your damages. This is why hiring a lawyer to handle your case or claim is usually in your best interests. If you still want to negotiate with the at-fault party’s insurance company yourself, start by reading all the articles on this blog – we have great advice about insurance adjuster tactics and what documentation you need to prove your case.